Imagine buying shoes that can self-adjust to your feet or developing a medical device that can perfectly adapt to a patient’s anatomy when triggered by a specific stimulus. These are just some of the potential uses of 4D printing — an exciting, growing area of research. 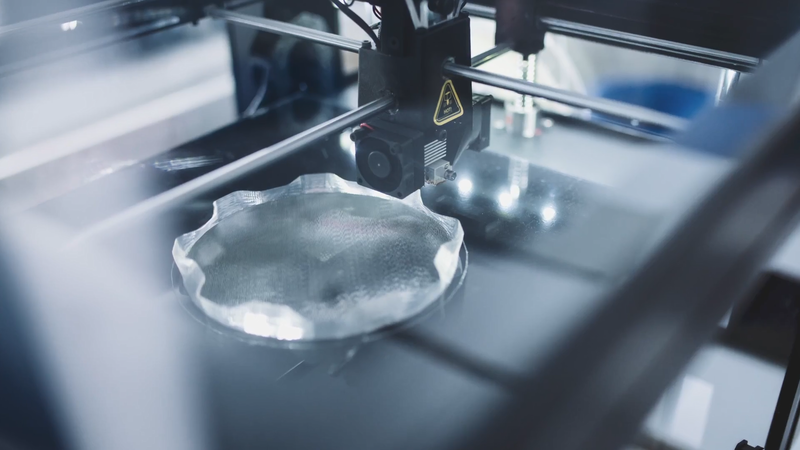 While 4D printing may seem like something out of a science fiction novel, Gartner predicts that $300 million will be invested into 4D printing by 2023, although the technology is still some way off from commercial availability. So what exactly is 4D printing and how can it benefit manufacturers? Today’s article will look at how 4D printing works, as well as the current and future applications of the technology. 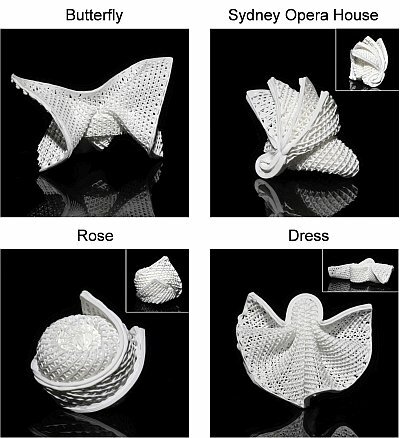 4D printing gives 3D printed objects the ability to change their shape over time. The term “4D printing” refers to this additional fourth dimension: time. The emerging technology combines 3D printing techniques with high-level material science, engineering and software. Materials play a crucial role in 4D printing, as the technology uses materials that have been specially designed to react to a specific stimulus. Common stimuli that can cause fabricated objects to transform include temperature changes, light, water, magnetic fields as well as chemical and other environmental factors. When triggered by an external source, 4D printed objects can fold or unfold themselves in predetermined shapes, opening the door to a range of exciting applications we’ll be exploring below. 3D printing is a rapid prototyping and manufacturing technology that deposits material layer by layer to create three-dimensional objects. Fundamentally, 4D printing uses the same techniques as 3D printing to create parts. The key difference is that 4D printed objects change their shape over time once printed, while 3D printed object maintain the same, fixed form. During the 4D process, a geometric code is added that contains “instructions” on how a shape will move or change once triggered by a stimulus. This preprogramming step enables the creation of smart, responsive objects that can adapt to specific environmental factors. Getting to grips with 4D printing first requires an understanding of how a material will react to a certain stimulus. Using this knowledge of material behaviour, engineers can design an object with variations in its material structure. Based on digital CAD design, a model is then 3D printed, either in a single or in a composite material. Once the printing process is complete, a preprogrammed geometric code will dictate how different areas of the object should react to a specific stimulus. With this approach, engineers can create components that take predetermined shapes or fold and unfold in certain ways when triggered by a specific stimulus. While the first three typically work with polymer-based materials, common SLM materials are metals. Notably, the recent progress in 4D printing can largely be attributed to the advancements in Material Jetting technology, which enables multi-material printing. This technology works by jetting droplets of material, allowing its deposition to be tightly controlled. Which materials can be 4D printed? As we’ve seen, the technology uses specially-designed ‘smart’ materials that have one or more properties that can be changed by outside triggers. Hydrogels are hydrophilic networks of polymeric chains that can retain a large amount of water. Hydrogels can be used in UV-curable 3D printing technologies and programmed to change shape in response to temperature changes. Since their composition is mainly water, hydrogels are biocompatible and therefore especially well-suited to medical applications. Hydrogels can also be used in applications like soft robotics and flexible electronics. Last year, engineers from Rutgers University developed a 4D printing method to create a smart gel that could aid the creation of living structures in human organs and tissues The material used? Hydrogel. In this application, the hydrogel material changes shape when exposed to temperature changes. In addition to furthering biomedical applications, this development could also enable new applications in soft robotics, including flexible sensors and actuators. Shape-memory polymers (SMPs) are polymeric smart materials that have the ability to shift from a fixed temporary shape to their original shape when exposed to an external stimulus. Because of their active actuation capability (the ability to move and control a mechanism or system), SMPs have found various applications in aerospace, soft robots, biomedicals and other fields. Shape-memory alloys (SMAs) are smart metal materials, which, similarly to SMPs, retain a “memory” of their original shape and can revert back to this original shape after deformation under a stimulus. SMAs can find uses in a variety of fields, such as aerospace, civil engineering and biomedical devices. Last year, a research team from the City University of Hong Kong demonstrated a novel ceramic ink, which combines polymers and ceramic nanoparticles. The 3D-printed ceramic precursors printed with this ink are soft and can be stretched three times beyond their initial length. Some of the promising applications of this material include electronic devices as well as applications within the aerospace industry. 4D printing holds exciting potential for the way products are manufactured today. Let’s take look at the possibilities 4D printing opens in more detail. The ability to produce intelligent materials that react to external factors is a key advantage for the aerospace industry. Here, 4D printing can be used to make self-deploying structures for air ventilation, engine cooling and other similar uses. Airbus SAS, in partnership with MIT’s Self-Assembly Lab, is already working with 4D printing to develop a solution that will cool its engines depending on temperature and other factors. In one example, Airbus and MIT worked on developing an air inlet component that can transform in response to aerodynamic conditions to decrease air resistance. The air inlet that was created can self-adjust to enable the automatic control of the air flow used to cool the engine. Using carbon fibre, engineers programmed the material so that it can respond to pressure forces. The inlet has been successfully tested in a wind tunnel and could be used in future in place of the heavy mechanical system currently performing this task. Space missions can also benefit from 4D printing. For example, researchers from Georgia Institute of Technology used shape-memory polymers to 3D print the structure made of struts. This structure is temporarily folded flat but can unfold when exposed to heat. Researchers believe their invention can be used to make antennas for spacecraft and shape-changing soft robots. The benefits of 3D printing for the defence industry are wide-ranging. Now, the industry is looking to 4D printing for more applications. One of the more promising uses of 4D printing could involve military uniforms that can alter their camouflage or better protect against poisonous gases or shrapnel on contact. Researchers are also exploring ways the military could use self-assembling objects, including the possibility of shelters or bridges that assemble themselves. The potential of 4D printing in the medical field is enormous. Here, the technology could be used in applications ranging from tissue engineering and smart biomedical devices to the fabrication of nanoparticles and nanorobots for chemotherapy. For example, researchers at MIT have developed a 3D-printable ink infused with magnetic micro-particles. Structures 3D printed with this material are magnetic and can, therefore, be remotely controlled. This technology could be used to make devices that can be guided by a magnet through the gastrointestinal tract to take images, extract tissue samples, clear a blockage, or deliver certain drugs to a specific area of the body. Another potential application of 4D printing lies in tissue engineering. In this field, biocompatible hydrogels could be used to print an artificial skin for grafts and even implants capable of changing shape and functioning without outside intervention. Back in 2016, BMW showcased its futuristic vision of a concept car, which included 4D printing. One of the elements included using 4D printing to produce car components that can adapt to changing environmental conditions. 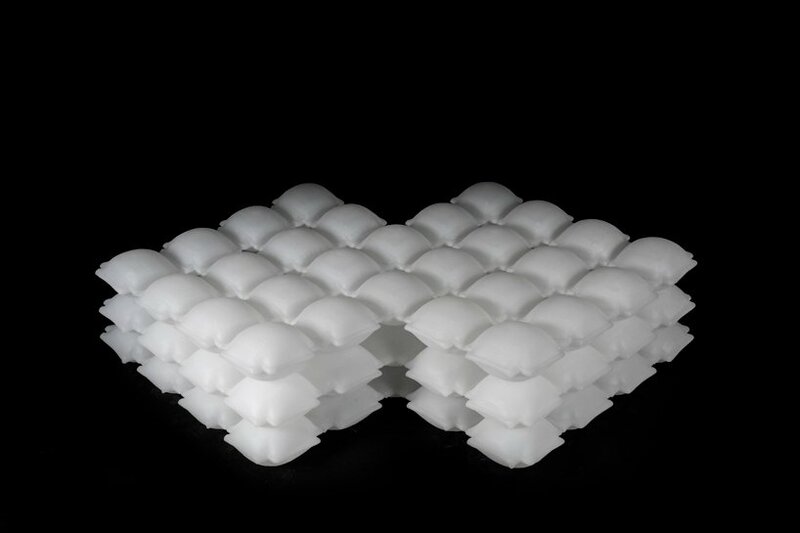 While this was only a concept, two years later the automaker, in collaboration with MIT’s Self-assembly lab, announced the creation of an inflatable 4D structure that can self-adjust based on changes in air pressure. Made of silicone, the inflatable material reflects BMW’s vision of adaptive design. One way the 4D structure could be utilised is for car seats, providing adaptive support and comfort — or even for impact performance in the form of airbags. The production of consumer products is yet another area that could be reimagined by 4D printing. For example, the technology could be used to make flatpack furniture pieces like chairs and tables, which would self-assemble when triggered. Once purchased, 4D printed furniture would simply pull itself together — eliminating the need to open up a box and assemble all of the parts manually. Ultimately, this could lead to products that would require less storage space and make for easier transportation. 4D Printing: the next big thing? 4D printing is a fascinating area that opens up exciting possibilities for manufacturing. The ability to make objects with programmable functionality could transform the way in which goods are produced. However, it’s important to note that most of the projects discussed here are still in the research and experimentation phase — and the technology has a long way to go before it becomes commercially viable for businesses. But, as research continues, the impact of 4D printing could be huge, touching applications across a range of industries. Realistically, it will take several years, or perhaps even a decade or more before we see mainstream applications of 4D printing. That said, the technology looks set to follow 3D printing’s evolution of to become the next disruptive technology in manufacturing.